Pistachios are an excellent food choice for individuals trying to lose weight. The pistachio is part of the cashew family and is native to Central Asia and the Middle East. The tree produces seeds that are widely consumed as food. The plant is a very hardy and can survive in temperatures ranging from -10 °C (14 °F) in the winter to 48 °C (118 °F) in the summer. The fruit is a drupe that contains an elongated seed that is edible. There are several known health benefits of pistachios. Pistachios are an excellent food choice for individuals trying to lose weight. Studies have suggested that pistachios are ideal, compared to other nuts, for weight management because of their low calorie content, high protein levels, and low saturated fat and high unsaturated fat content. In terms of pistachio nutrition facts, an ounce (28 grams) of pistachios contains six grams of protein and 11 grams of unsaturated fat. Unsaturated fat has the potential to improve blood cholesterol levels and decrease the risk of heart disease. Pistachio nuts are also a significant source of dietary fiber. Dietary fiber can prevent constipation and help the body eliminate biological wastes, while also helping maintain healthy blood sugar levels. An individual should consume at least 25-38 grams of fiber each day, depending on their gender. This is especially useful for individuals with diabetes because fiber prevents sudden sugar crashes that could be fatal. Fiber can also assist in removing cholesterol out of the arteries and blood vessels. Also, researchers have shown that pistachios contain antioxidants that reduce the harmful process, called glycation, in diabetics. Glycation occurs when sugars form inappropriate bonds with proteins and make them unusable. Antioxidants can also help prevent diseases, like cancer and heart disease, by neutralizing harmful chemicals called free radicals that mutate the DNA. Pistachios contain other antioxidants, such as lutein and zeaxanthin, which help in reducing the risk of age-related macular disease, which causes visual impairments and blindness in elderly adults. These antioxidants defend tissues from damage from the free radicals. 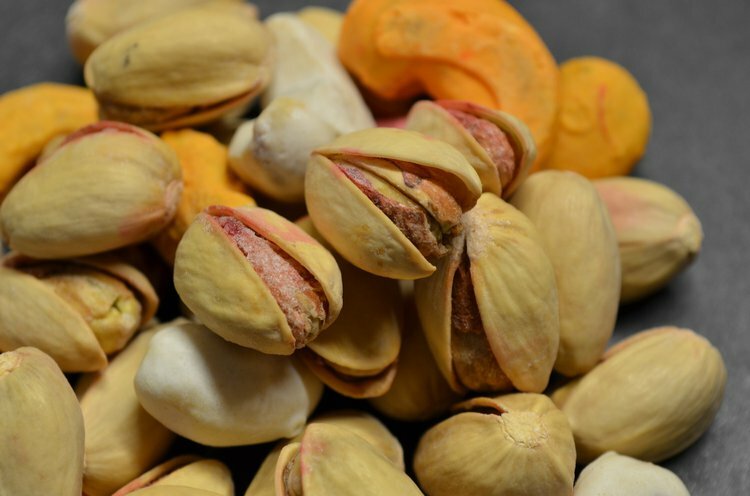 For better energy production, pistachios contain manganese. Manganese is an essential mineral for energy production and antioxidant defense. Some enzymes need manganese to destroy harmful biological waste products such as free radicals. In addition, pistachios assist the body in producing healthy red blood cells, which carry oxygen to all cells in the body. Iron is essential for hemoglobin formation. Since the brain takes in about 20% of the blood’s oxygen, better blood flow means that the brain is able to function better. Thus, adding pistachios to one’s regular diet may benefit both the heart and brain. However, one needs to ensure that pistachios do not contain any added salt or sugar. ALTURFAN, A. A., ALTURFAN, E. E., & USLU, E. (2009). Pistachio Consumption has Beneficial Effects in Diabetic Rat Model. Sağlık Bilimleri Tip Dergisi, Fırat Üniversitesi, 23(3), 131-135. Dreher, M. L. (2012). Pistachio nuts: composition and potential health benefits.Nutrition reviews, 70(4), 234-240. Goli, A. H., Barzegar, M., & Sahari, M. A. (2005). Antioxidant activity and total phenolic compounds of pistachio (< i> Pistachia vera</i>) hull extracts. Food Chemistry, 92(3), 521-525. Li, Z., Song, R., Nguyen, C., Zerlin, A., Karp, H., Naowamondhol, K., ... & Heber, D. (2010). Pistachio nuts reduce triglycerides and body weight by comparison to refined carbohydrate snack in obese subjects on a 12-week weight loss program. Journal of the American College of Nutrition, 29(3), 198-203. Yazdanpanah, H., Mohammadi, T., Abouhossain, G., & Cheraghali, A. M. (2005). Effect of roasting on degradation of aflatoxins in contaminated pistachio nuts. Food and Chemical Toxicology, 43(7), 1135-1139. Fabani, M. P., Luna, L., Baroni, M. V., Monferran, M. V., Ighani, M., Tapia, A., ... & Feresin, G. E. (2013). Pistachio (Pistacia vera var Kerman) from Argentinean cultivars. A natural product with potential to improve human health. Journal of Functional Foods, 5(3), 1347-1356. Khatib, S., & Vaya, J. (2009). Fig, carob, pistachio, and health. Bioactice Foods in Promoting Health Fruits and Vegetables, 245-263. Bulló, M., Juanola-Falgarona, M., Hernández-Alonso, P., & Salas-Salvadó, J. (2015). Nutrition attributes and health effects of pistachio nuts. British Journal of Nutrition, 113(S2), S79-S93.